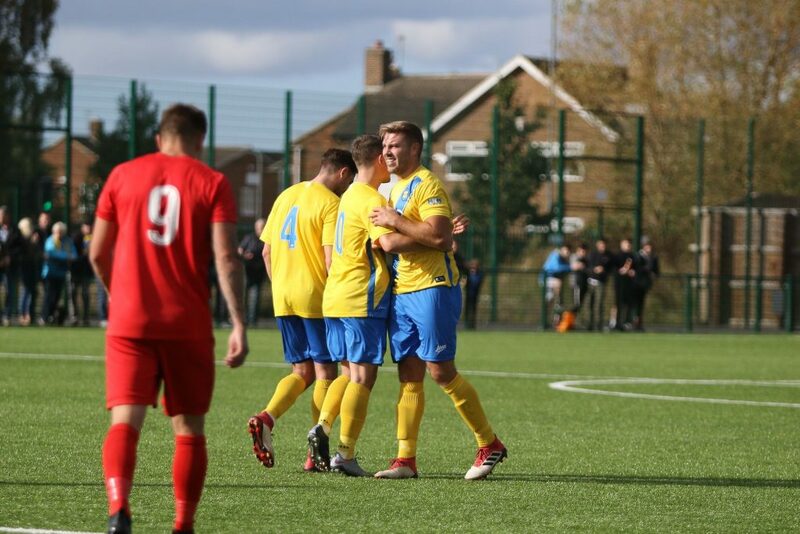 Stockton Town returned to winning ways in style with a 4-1 victory over North Shields at the Coverall Stadium. Goals have been flowing for The Anchors of late and the torrent continued as Pete Bulmer and Jake Petitjean complimented a Dale Mulligan header to seal the points in this one. Michael Dunwell was forced into a few changes with Adam Nicholson, Tom Coulthard, James Ward and Chris Stockton all unavailable. That meant a back four for Stockton with Jordan Robinson returning in the heart of defence. The game endured a rather tentative opening with both sides feeling each other out and unwilling to over-commit. This meant chances came at somewhat of a premium in the early going. The first chance of the game fell to North Shields as Paul Robinson worked his way past Matthew Garbutt on the left. The veteran winger may have got the better of the full back but couldn’t best Michael Arthur as the Stockton goalkeeper repelled his effort at the near post. Michael Aurthur made several good saves to preserve the lead. The Robins were fortunate not to go a goal behind on the quarter of an hour mark and they were almost the architects of their own downfall. Max Craggs’ inswinging corner from the right was almost diverted into the Shields net by Curtis Coopen with the defender fortunate to see his clearance drop just wide of the post. The game was coming to life and Arthur was called upon again on 23 minutes. Some loose play in the middle of the park from Stockton was pounced upon by Ryan Carr. The forward struck goalwards from 20 yards out but was denied by a smart stop from Arthur low to his left. Three minutes later, Stockton had the lead. Craggs sent over another threatening corner and this time the visitors’ couldn’t keep it out. Dale Mulligan’s powerful header from close range gave Gregg Purvis no chance as it thundered past him via the crossbar. 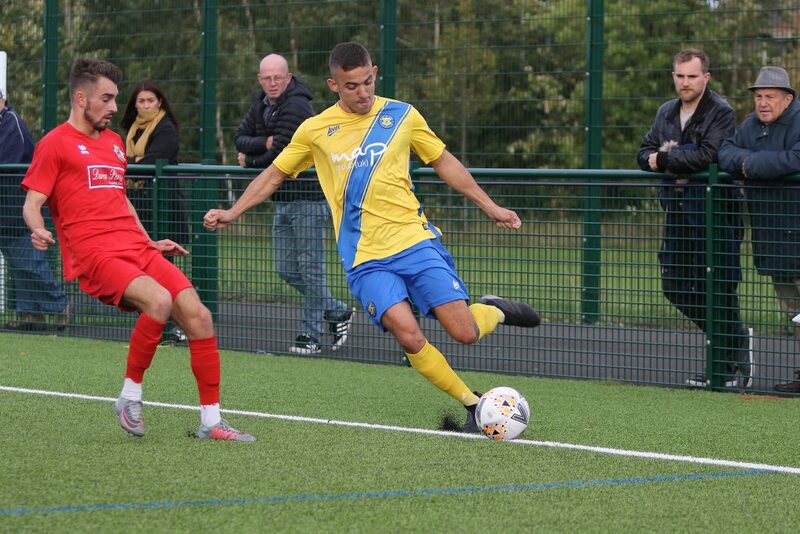 Two goals from Dale Mulligan had given Stockton Town a two goal lead at half time. Stockton controlled the play well and were looking much tighter in stopping chances than in previous games. They would double their lead just five minutes before the interval and it would prove to be a similar story to the first goal. Another wonderful inswinging corner from Craggs found the head of Dale Mulligan and the defender made no mistake again from close range as he headed in his second. 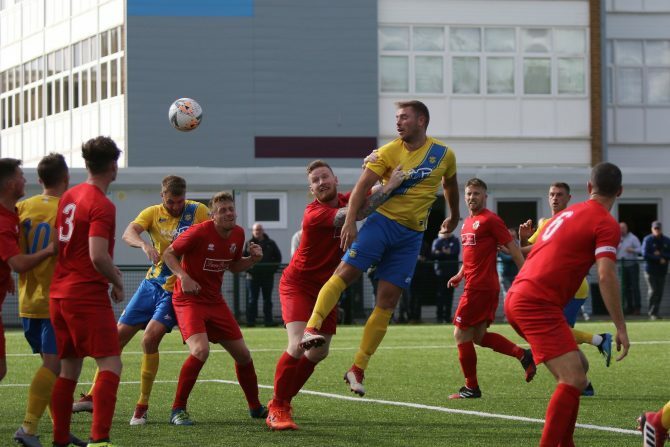 The Anchors weathered a game start to the second period from North Shields without giving up any clear cut chances before having the opportunity to be out of sight themselves ten minutes after the restart. James Risbrough, playing as a left back in the reshuffled Stockton backline, gave Robins full back Craig Spooner a torrid time all afternoon. He demonstrated his pace as he ghosted past the right back before fizzing a tempting ball across the face of goal. Several yellow shirts were advancing but somehow the visitors managed to scramble the ball away. North Shields would go close to halving the deficit on the hour mark. 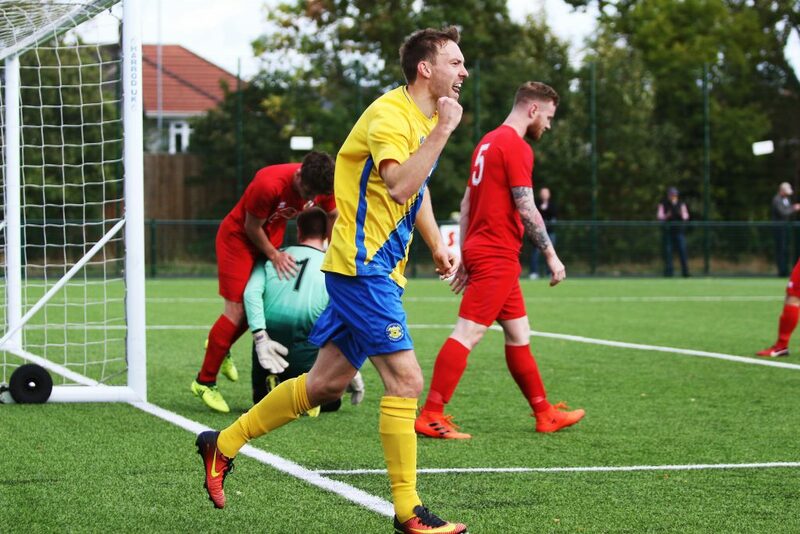 Sean McRoberts unleashed a powerful shot from just outside the area that had Arthur well beaten but his strike crashed off the crossbar to preserve the Stockton advantage. The visitors were still bemoaning their luck from the effort as Stockton went up the other end of the pitch to put the game to bed. Bulmer led the counter attack down the left, he got in behind Spooner and squeezed the ball past Purvis at the near post to give his side a seemingly insurmountable advantage with just half an hour to play. Peter Bulmer celebrates scoring Stockton’s third. Bulmer would turn creator ten minutes later to set up what should have been Stockton’s fourth. His clever reverse ball played Risbrough clean through on goal. The left back’s effort was wild and lacking in composure and sadly didn’t provide him with the goal that his performance undoubtedly deserved. The visitors fired a warning shot to remind Stockton that they were still fighting on 74 minutes. The Anchors’ defence switched off and were still appealing for offside when Robinson whipped over a cross from the left. 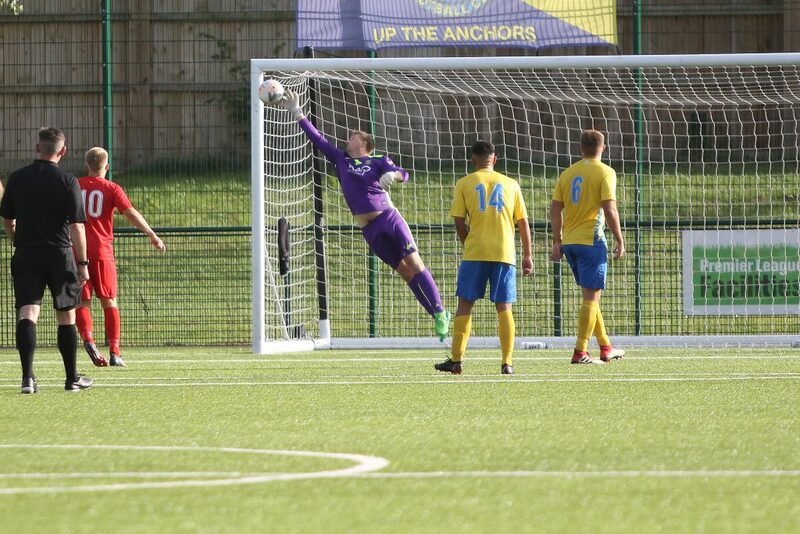 His pinpoint delivery found the head of Carr but a superb save from Arthur preserved his clean sheet before the forward struck the post from close range on the rebound. The Robins finally got their goal ten minutes from time to set up what had the potential to be a nervy climax to the game. McRoberts’ corner found Carr completely unmarked in the area and the forward’s header gave Arthur no chance on this occasion. Fears of a nerve-jangling last ten minutes were ended just two minutes later as the Anchors grabbed a fourth. More stunning work from Risbrough down the left saw him sail past Spooner once more before looping a perfectly weighted chipped cross onto the head of substitute Petitjean who couldn’t miss from two yards out. James Risbrough was voted man of the match for his performance by Anchors fans. It was an excellent performance from an Anchors side that were missing several key players but who converted the chances they created clinically to earn three valuable points. Stockton Town: Arthur; Garbutt, Robinson, D Mulligan, Risbrough; Woodhouse(Petitjean 80’), N Mulligan(Mohammed 62’), Craggs; Bulmer, Coleman(Carter 82’), Roberts. Subs Not Used: Cossavella, Dunn. Goals: D Mulligan 26’, 40’; Bulmer 61’; Petitjean 82’. North Shields: Purvis; Spooner, Coopen, Hughes, Summerly; Suddick(Sampson 66’), Hall, Ormston, Robinson(Cornish 66’); Carr, McRoberts. Subs Not Used: Forster, McNamara, Cooper.